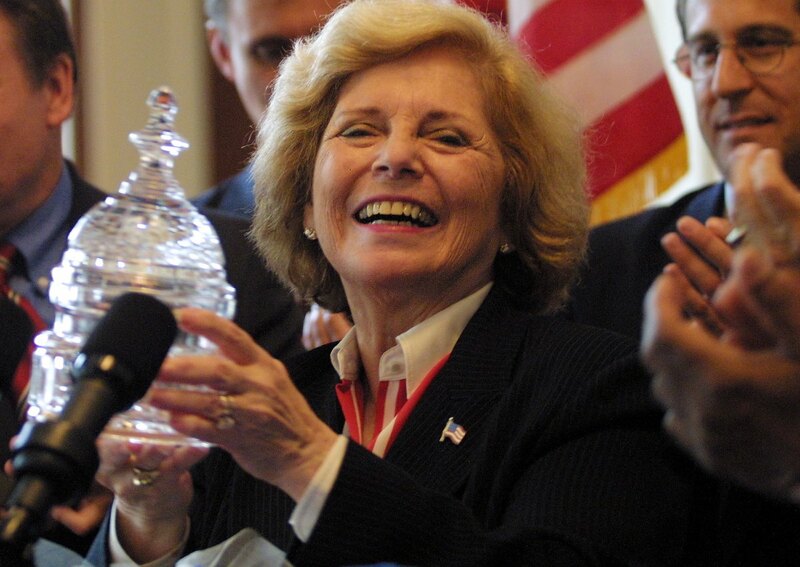 Marge Roukema, a moderate who represented northern New Jersey for 22 years and was the lead Republican pushing for the Family Medical Leave Act, died Wednesday. The 85-year-old former House member had Alzheimer&apos;s and died in Wyckoff, The Bergen Record reported. Rep. Scott Garrett, R-N.J., who succeeded Roukema in representing the 5th District and who fell short in two primary challenges to her in 1998 and 2000 before winning the seat after she retired in 2002, released a statement that said, "I am very saddened to learn of the passing of Marge Roukema. I have always respected her commitment to serving the people of New Jersey. My thoughts and prayers are with Marge&apos;s family and friends at this time." Roukema teamed up with more liberal Democrats to push the FMLA, only to see President George Bush veto versions of the legislation twice. President Bill Clinton signed a version into law in 1993. She frequently found herself opposing her GOP colleagues — and more than a few moderate and conservative Democrats — on a range of hot-button issues such as abortion, gun control, the environment and health care. Rep. Bill Pascrell Jr., a Democrat who represents the neighboring 9th District, said in a statement that Congress could use more members like Roukema. "A tireless advocate on behalf of workers and education, Marge was not afraid to reach across the aisle to do what’s best for all Americans. This is an example of the type of bipartisan leadership we could use today. Marge believed in a fiscally conservative budget that did not hurt the working poor or middle class, and was very outspoken on human rights both here at home and abroad."